Infusionsoft by Keap Review: "Great for small businesses!" We are using Infusionsoft strictly for Marketing. Our other departments are using other technology, which makes it a little more difficult to use. It helps us to solve many problems, though, at an affordable price. With it we can create web forms, do email marketing, implement automation, set up a sales pipeline, and segment our leads into usable lists. It is a pretty flexible system because of their tagging system. It allows you to group and segment your contacts very easily. Their customer support is amazing! There are few companies whose customer support is as helpful as theirs has been to me. You can send support email tickets, do online chats with representatives, or you can give them a call and talk with a real person. They always do their best to help you. They have many different tools that they integrate with, so you're almost guaranteed to be able to do anything you need to. If you can't find the right integration, the API is open for you to be able to use. Reporting. This probably has been the biggest area of frustration. You can create some good reports based on custom-saved searches and reports, but I have often found their reports to not be very useful. Their web forms are easy to use and useful but they need an updated look. They look like they belong in the early 2000s era. Like almost all software, there is a learning curve to getting used to their system. Infusionsoft excels with small business. It really tries hard to represent the small business community. If you are a small business, there is a good chance it will work well for you. If you are a part of a medium or large business, however, just think twice about it and consider other options first. Infusionsoft by Keap Review: "Infusionsoft Trained and Taught The Important Things"
Infusionsoft was being used to handle the marketing and communications efforts for admissions. It was used to reinforce messaging across the campus level, as well as to potential customers. The issue it was designed to address was one of maintaining consistent and clear communication, as well as to reach out - also consistently - to people who would be interested in our program. It is only used by those in marketing; however, there have been additional users who had been introduced to it for special projects. User interface. It is clear, concise, and easy to understand. It is made for a visual learner - especially one who has no history with programs like this. Tracking. It's important to be able to follow a path when it comes to a customer. Some programs make it nigh impossible to track customers beyond the initial stage; infusionsoft allows for a lot more tracking than this, meaning better lead data. Support. The people are easy to work with, they try to understand what you are going through, and how to explain difficult concepts in a clear and concise manner. Fees to begin. This was a while ago, but we were charged a rather large fee just to begin. It wasn't worth it because at the time we weren't entirely sure what direction we wanted to go in. Automated campaigns can be complicated if you don't know what you're doing. Support can be helpful, but you will have a few moments where you feel completely lost. The builder is great, it's the process that's the drawback. Reporting. For a program with a great ability to track, the reporting leaves something to be desired. Automated campaigns. It can reach customers at virtually any level in the process. It can reach your customers for you, with pre-set emails and offers, so you don't have to spend hours analyzing the data and questioning if you need to send an email. Set up a rule and it will do it for you! It is less appropriate in front of house. This is more relationship building and developing the bond with the customer to make the sale. It is not really too useful after you've made the sale (unless you are trying for multiple sales over time) and the initial sale comprises a contract or long term agreement. Infusionsoft by Keap Review: "Great ROI for Investment"
To improve conversion rates via email marketing campaigns such as (Abandoned cart, Sample, Quote and drip campaigns). The lead scoring option allows us to target highest converting customers and further refine efforts for on-going and future campaigns. Easy interface and cloud-based application allows us to add, update and delete campaigns from home office and remotely. We have experienced an 18% increase in latent engagement, which was non-existent prior to integration. Any SMB organizations that utilize email as a customer access channel for leads generation, interaction, and conversion. ERP solutions may not benefit from this application at the time we integrated. We don't use the CRM portion of the application to its fullest capabilities as we use Net Suite within. I remember reading that they have or will have that offering. We utilize large campaigns and we will be in the ERP zone soon, so it will be great if they did. Infusionsoft by Keap Review: "Robust Enough For Whatever You Throw At It"
Infusionsoft is being used by my company as the defacto marketing automation platform. We are an integrated agency that uses it for all email campaigns. Since our campaigns are primarily time sensitive, we have a lot of Infusionsoft sequences and over a million contacts held within the platform that we push through campaigns at different times. It addresses (quite well) the need for audience segmentation and activation. Audience Segmentation- Easy to do and to drop into campaigns. Tagging contacts- Probably one of the easier ways of doing it compared to other marketing automation platforms. Hard to learn, the platform is not intuitive. There is not just one way of doing something, there are multiple ways of doing it, and some of them work in only unique applications. The platform buildout is extensive and hard to systemize. Infusionsoft is well suited for any mid to enterprise level organization that needs a marketing automation platform that is robust enough to handle a lot without you needing to worry about if it is going to work when you need it to or how you need it to. It is not needed for smaller organizations that don't have extensive automation needs. Infusionsoft by Keap Review: "A robust, automated solution for smaller organizations"
Infusionsoft was used to help support outreach efforts for a local organization that I was working with. The software application is essentially a CRM type program that provides sales and communications support without a huge price tag found on rival packages. It was used with a small base of volunteers and users and worked very well within that small user base. It was easy to learn, utilize, and support. It helped provide services for outreach communication and funding campaigns. The program works very well with a small base of employees without a need for extensive support. The program has some feature-rich solutions for mobile platforms as well. The interface works well and is easy to utilize, even for novice users. Some of the reporting features are not as extensive as other CRM programs but that is to be expected at this price point. Contact management functions may not be as powerful as they are in products such as Salesforce. In some instances, there were problems with file upload support. The product works really well at providing automated marketing tools combined with email support. While it can be more expensive with a large audience of contacts, for smaller audiences, the program works well with small to medium marketing groups. There is an auto-responder feature that can be really useful, especially with lower levels of staffing in an organization. Infusionsoft also has some really good reporting tools for reviewing the success rate of outreach campaign efforts. Infusionsoft by Keap: "Infusionsoft Review"
With Infusionsoft, I'm now able to tag and track every single lead that inquires about my services from the initial touch point all the way up to becoming a paying client. It's taken the stress out of managing new leads and follow-ups and has given me the freedom to focus on my clients. Not only that, but I've also been able to create campaigns that target patients after they're done working with me in addition to easily sending out broadcast emails weekly, which allows me to easily stay in touch with all the people that I've worked with. This helps me to stay top of mind so that when something does pop-up, or a friend of theirs has a need, I'm the first person they think of. In short. Infusionsoft has been invaluable for the growth of my business and I'd highly recommend it to any small business who is serious about growing. InfusionSoft will warn you about an increase in bad email addresses, allowing you enough time to clean it up before it affects your business badly. Another great aspect is the help provided by agents via the Chat facility, you can chat live with an InfusionSoft assistant to help you with any problems you might have. I find it extremely helpful in times when I am unsure of what to do. I also love the community. Going to ICON (the conference that infusionsoft puts on) was one of the best experiences I have had. It was amazing to see thousands of small business owners making things happen and helping each other. Infusionsoft has a lot of things that are cookie cutter easy, but I think of it more like a cookie cutter maker than some software that does one or two things well and leaves businesses lacking in functionality or customization.
. 2) The platform is about 5 years behind the times. Powerful but the look, usability, and feel are dated. Its integration is less ubiquitous than that of SalesForce, but is growing constantly. 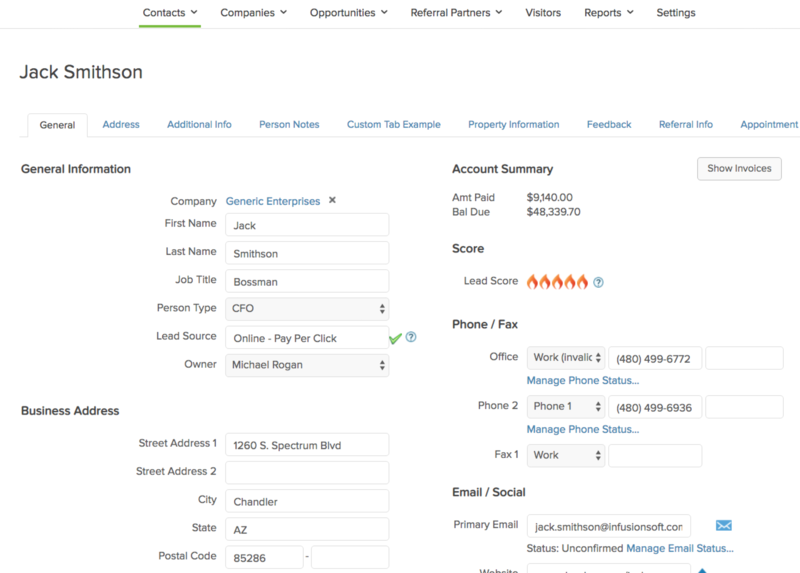 Infusionsoft is a CRM solution designed for small businesses. It's not the tool for enterprise or medium-sized businesses needing more than 15 to 20 seats. 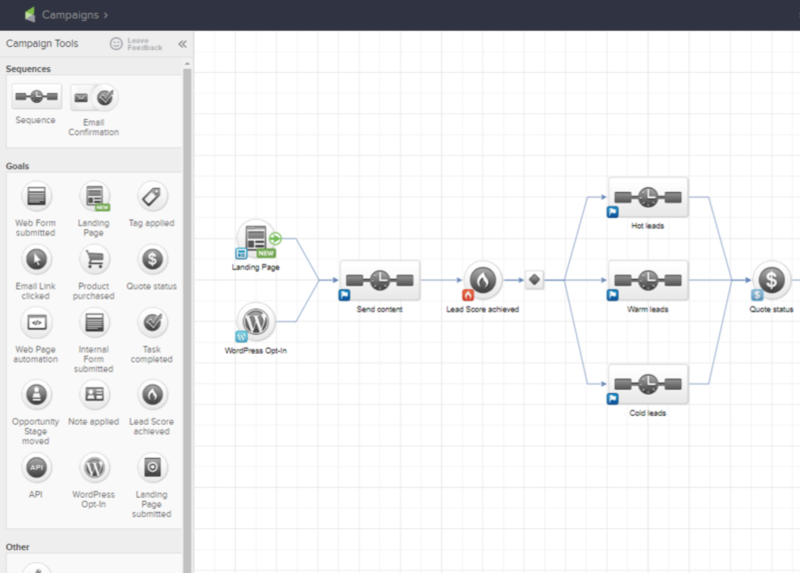 Think of it as a MailChimp/Salesforce with an emailing workflow engine. It allows you to build email sequences that adjust the content you send based on what each contact does. That's an oversimplification, but at its core, that's what it does. It's got a huge community of add on products supporting it. You can build membership sites with it. You can enable call centers with it. The applications are numerous, but it is not a tool for everyone. There are times when its not a fit. Many business owners take it on expecting to configure it with minimal outside help. That is probably not a good idea. It's like building your office network yourself following YouTube video instructions. You may get it done, but not without a lot of time and frustration. Even worse, when you are done, you may have made mistakes an experienced person would never do that keep you from making the best use of the tool especially in the long run. Infusionsoft by Keap Review: "Infusionsoft works, but not well enough." We used Infusionsoft to import initial leads from our website. This enabled us to route that lead to the sales manager for the area while keeping a birds-eye view on all leads. We used Infusionsoft company-wide. This solved the problem of not getting lead notifications and having stages for the leads since we moved from a much older manual system. This also enabled us to email leads right from with our pre-made templates which sped up the sales and vetting process. Notifications - The notifications were brief (we made them this way) and gave you exactly what you needed to get started without filtering through unnecessary information. Stages - Easy to see lead stages made it possible to jump right in on a lead from a few days (or weeks) ago and put them in the next appropriate stages. Contact History - It was easy to see the contact history with the lead all in one place. This also let us see the engagement of the lead. Clunky Interface - When we used Infusionsoft there was too much clicking around. For example: If you wanted to update the stage of a lead, and add notes you needed to click into and out of multiple screens. UI - The user interface was not user-friendly. It wasn't bad (it seemed like an early 2000's style design) but it did not include dynamic features that made it easy to navigate and use. While Infusionsoft works for it's intended purpose, I wouldn't recommend it over other similar tools. It seems like there's a lot more work that goes into managing leads and contacts than necessary. It would be suited better for people with smaller data sets perhaps, but again being able to see everything about a user in one place is essential and we found not possible with Infusionsoft. Infusionsoft by Keap Review: "Infusionsoft: A Powerful CRM"
Infusionsoft is currently being used across all employees and allows us to sort and filter through our members and develop email campaigns for specific individuals. In my case, if your company has a database of individuals (members, clients, ect. ), Infusionsoft allows for categories to be created and tags to be applied to each person, creating an easy way to search for and market to specific individuals within your database, without having to go through and handpick specific individuals to include. Infusionsoft by Keap Review: "Good for small business, bad for start ups." Infusionsoft was used as the primary marketing automation, email marketing, and CRM system. Marketing and sales would use Infusionsoft daily. We would send emails, create landing pages and forms, and track sales within Infusionsoft. It addresses the issue of tracking and converting prospects into customers. It also addresses the problem of not needing a bunch of systems to accomplish these goals. All-in-one. Infusionsoft definitely simplifies some operational aspects by having marketing automation, CRM, and eCommerce in one place. No complex integrations to manage. 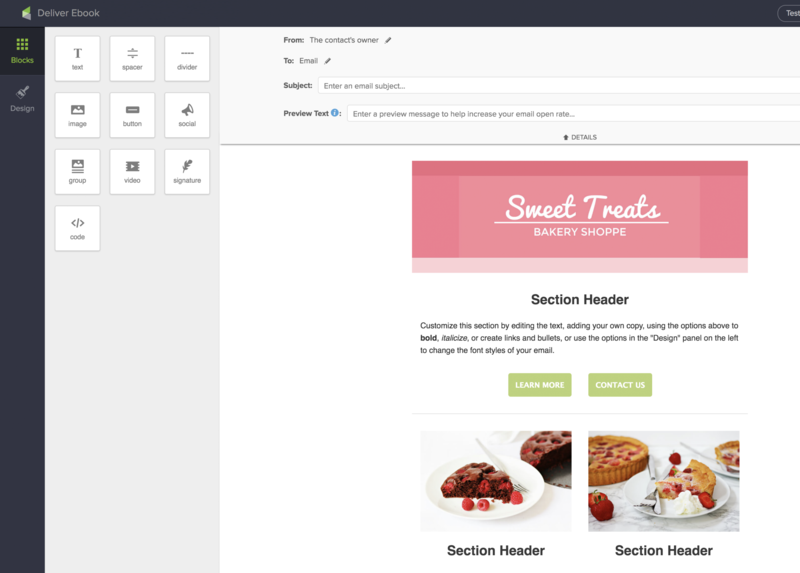 The visual campaign builder is solid and fairly easy to use. Good for new marketing automation users. The landing page builder has made huge strides. It's not best-in-class by any stretch, but they have made some great improvements. You can build good LPs within Infusionsoft. The automation builder is very limited. While easy to understand and use, the criteria you can automate is lacking compared to other options in the market. Layering on multiple criteria (Ex: visits X page in the last Y days and has Z job title) can require some complicated decisions trees. The CRM is very, very rigid. You cannot hide fields or meaningfully adjust the layout. This leads to slow and overly complex user experiences for sales. Many competitors lack deliverability and general performance. Infusionsoft was an industry pioneer. I give them a lot of credit. But, that also means a lot of their tech is ancient (google: technical debt). No product can be perfect, but I noticed some alarming glitches. Infusionsoft is well suited for those with basic marketing automation and CRM needs. More specifically, if you want to automate based on whether an email was opened, Infusionsoft is good. If it's more nuanced, you have better options. For those with a limited budget, Infusionsoft is a good value. Buying separate marketing automation, CRM, eCommerce, landing page software will cost much more. My principal concern is that Infusionsoft will be outgrown. If you anticipate your business staying small (which can be a good thing! ), it may not be an issue. But, if the goal is to scale, this could be a huge headache in 1-2 years. Infusionsoft by Keap Review: "Needs to be at the center of your app stack"
We wanted a tool to manage lifecycle automation in conjunction with Pipedrive, including SMS. We liked that contacts could begin in Infusionsoft without an email address, which is virtually unheard of in ESPs these days. And we didn't need an ESP. We have Drip for that. We needed something more robust. Infusionsoft appeared to be that tool. It is well suited if you need an email service provider or will build your app stack around Infusionsoft. It doesn't make a good helper tool as the integrations are primarily built to have Infusionsoft at the center of the stack. No Pipedrive integration. Infusionsoft by Keap Review: "Good If You Use It"
I have many clients that use it, so I've seen it used any number of ways. The most valuable function it provides is the thorough segmentation (through tags) and communication (through campaigns & broadcasts) with prospects and clients. Their campaign manager function is the backbone of their app and can be built out to run countless numbers of automations, all around user behavior that you define. One client uses it to send out emails throughout the prospect process, as an augment to support their sales team in their follow up since they get too many leads to handle in a timely manner. That added communication builds a lot of trust with prospects and supports the sales team significantly. Campaign Builder: This is very robust and they were one of the first (if not the first) app that gave a visual builder with triggers and decision points to direct contacts through based on their activity. Tags: This is the key to effective segmentation and filtering of contacts and Infusionsoft's tag categories and application approach is superb. Email Builder: They updated this in the past couple years and it was a massive improvement over their legacy email editor. It works great and is a breeze to use. Shopping Cart: It's not responsive in design and is super basic. I don't understand why they haven't updated it when selling products is such a key value of the system. Landing Pages: These are horrible and you'd be better off using Unbounce for them. Custom Fields: They limit you to 100 custom fields across the entire app and any decent marketer will use them up very quickly. This is a limitation of their legacy code base and I don't see them fixing this anytime soon. Email Throttling: Their throttling of emails has grown to a ridiculous level. If recipients flag an email as spam, they stop the campaign. I've had numerous clients unable to send broadcasts to paying customers because of this. It's great if your business is relatively simple and everyone using it is in-house. It's also great if you just want to use it for the marketing automation function within your organization, letting your sales team use another CRM for their pipeline management, and fulfillment managed through another platform, too. 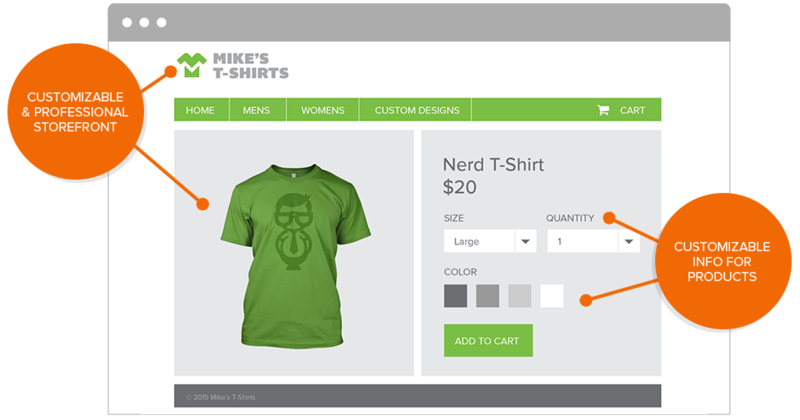 It can handle an e-commerce company, but you might be better off using something like Shopify and ActiveCampaign together. Infusionsoft by Keap Review: "Infusionsoft is robust, but hard to use"
We use Infusionsoft as a type of lead management and CRM for our franchise owners. Potential leads are collected from our website and put through an automated campaign within Infusionsoft. Our owners can then use a web app we built to update those leads within Infusionsoft. The campaign those leads are in depends on the status. This helps our owners keep track of the good and bad leads. We have also used Infusionsoft to help manage the franchise sales side as well. Infusionsoft is really robust. It offers a variety of options for the campaign automation and can really help those who need a more detailed automation process. The reporting system is also very detailed. You can get reports on contacts, emails, etc. It helps when you need to know exactly how your campaigns are doing especially when you have a lot of them. The biggest con for Infusionsoft is its learning curve. It's a robust system, but that comes at the cost of a bad UI, hard to learn automations, and a confusing development process. The backend of Infusionsoft has a lot in it and that often results in trying to find certain options or settings that aren't always where you'd think they'd be. The development API is poorly documented and just as confusing as the Infusionsoft UI. We built a web application that connected to our Infusionsoft account, but it was a confusing process to setup and also ran pretty slow with next to no options to optimize it. 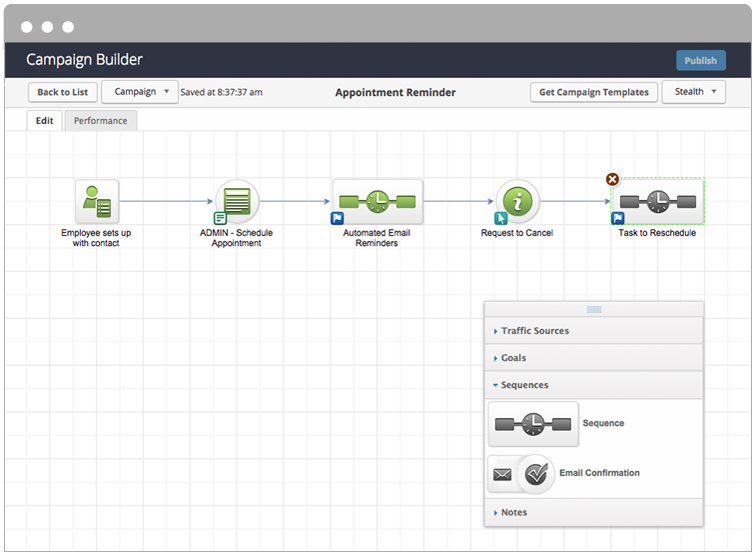 Infusionsoft is really good for those who need detailed reporting and a complex campaign system. If you're not building applications for it or won't have a large team involved with the setup process, then I would say Infusionsoft would be perfect for you. The biggest cons for Infusionsoft is the learning curve and poor documentation. As long as you can mitigate those, Infusionsoft is a great system that can work for just about any need. Big or small. Infusionsoft by Keap Review: "Infusionsoft helps manage time for tasks and email campaigns"
Our company is a real estate business in Philadelphia where we use Infusionsoft to organize our tasks and have a proper sequence of campaign emails that we send to our clients. It really helps us to create new ideas and be creative to coordinate well and be update for our clients. Infusionsoft has many tools that we need to manage email set-up and notification of projects or task that needed to be done. Making a profile for our clients makes us more updated and gives us proper knowledge to understand on each individual clients. They have an updates that makes our projects easier, such as email campaign and customization tools. Infusionsoft do email or campaign sequence which help us notify clients and us for our daily task. You can customize tabs or tools that can make your profiling and updates to clients. Automatic notification for scheduling, task or activity and projects that reminds you the time frame that needed to be done. It lets you be more creative in personalizing your emails or automatic response emails. You can see clients response or activity if they were opening the emails or not , if their emails bounce or if it is an unreachable email address. The new update for email campaign needed be more specific in terms of linking address. Hard to edit email response when the client click the done link from the email. If possible the tag that was in the history list could re-tag automatically once it was input. Infusionsoft is very reliable in terms of sending emails to the client. It automatically follows the program or campaign sequence that was set. IT gives much more help in profiling our clients and can customize if there is needed information to add. The email campaign sequence needed more guidance for some tools that are already deleted or changed by having new tools. Editing paragraphs are kind of hard since IT edits a whole paragraph rather than being specific. Infusionsoft by Keap: "Infusion Soft Review"
Displays information in easy to find places. Has very few glitches or problems. There are a lot of different applications that also make it easier to keep track of your own work. I like being able to upload files to manage our current clients completely in the system. I have had some glitches with the software where it doesn't record information specifically follow-up dates. I would like to be able to go back to what I had before without having to re-load my lists. I wish you could scroll rather than having to load more calls or load more of a history. Infusionsoft by Keap Review: "Infusionsoft - worth the bill if you fit the bill"
My business is utilizing Infusionsoft as an email platform and campaign builder to connect with customers and follow up with leads. We have integrated our Infusionsoft account with MindBodyOnline, Marketing Efficiency Consultants (a texting app), and Plivo (which supplies a phone number through which to text). Infusionsoft allows for categorization of clients according to detailed specifics, such as who has purchased a particular retail item or class package at our fitness studio. We can also target client groups who have shown interest on Facebook or who have asked for information via our website. Through this honed capacity to tag clients, we are able to follow up with crucial leads automatically. Infusionsoft only allows for a limited number of users; in our case, I manage Infusionsoft for the whole of our company. Our use of Infusionsoft prevents leads from falling through the cracks and also frees up ample time that our fitness instructors and sales staff would otherwise be using in tracking down elusive leads. Infusionsoft allows for an unlimited number of customized tags for clients, providing for virtually limitless categorizations through which to channel marketing campaigns. Infusionsoft integrates seamlessly with MindBodyOnline through BridgeBuddy and Infusionsoft app. This allows for many tags of my choice to be automatically assigned to our 5,000+ contacts, rather than these tags that had to be manually applied. Infusionsoft offers great customer support, with chats being available at any time. I would like to see Infusionsoft's functions being sold a la carte; my business utilizes the marketing and CRM features exhaustively but does not touch the sales and transaction processing features. It would be nice to pay for only what we use. There is a mobile Infusionsoft application available on phones, but building marketing campaigns is not an option here. It would be nice to be able to build campaigns, even rudimentary, from a cell device. I adore Infusionsoft but would love for it to be made more affordable. Infusionsoft is well suited for client bases of 1,000+, in my opinion. I think the program would be overpriced and too extensive for smaller businesses but is well worth the investment for businesses with larger client bases. It is also worthwhile for businesses with diverse client bases; the tagging and categorization qualities would be extraneous if used for homogeneous client bases. Infusionsoft by Keap Review: "Amazing Automation, Open API"
We use Infusionsoft across our entire business. It's used to manage our customers, their orders, notes on the customers, automate marketing campaigns to the customers, including e-mail, text message, direct mail, telemarketing, webinars, live event confirmation, manage their subscription programs and more. Marketing automation. I have not found another software or service that can compare in the complete automation of a marketing campaign. There is nothing I can't do by either utilizing Infusionsoft's built in marketing, or using the API connections to integrate with 3rd parties. Infusionsoft's API gives access to nearly every table in Infusionsoft's database that I would ever need to edit, giving me the ability to integrate with nearly any other system. E-mail. Although they have an excellent, easy-to-use e-mail builder, inbox deliverability is suspect. Although my messages always arrive, they often arrive in the spam folder if I'm mailing to a large number of people on my list at once. Automated e-mails that are part of a campaign generally make it to the inbox, because they're being sent to only a handful of people who have reached that step of the campaign on that day. But we are forced to use a 3rd party e-mail provider, whose sole service is to send e-mail, to send our large e-mail blasts. Luckily, Infusionsoft's campaign builder makes it easy to integrate with any 3rd party service provider, so we're still able to automate large blasts. Size. Infusionsoft is built for small businesses. They're not shy about admitting they focus on small business, sometimes ignoring the needs of medium to large businesses. I find that we may be starting to outgrow Infusionsoft in some areas, which scares me, because I don't think I'll be able to find a comparable solution to meet our needs. API Throttling. This goes back to Infusionsoft focusing on small businesses. Infusionsoft has throttling on their API limiting any one business to a bank of 10,000 API calls, which recovers at a rate of 2 API calls per second. This forces developers to program efficiently to minimize API calls, which sometimes requires inefficient coding to pull out as much data as one can in one call instead of making several smaller calls for significantly less data. For example, I may need a list of Contacts and their addresses that purchased a certain product yesterday. *Normally*, I would make a call to the table that stores items ordered and gather the Order Id's that match the product on that date. This may return say 10 orders. That's one API call. Then, I'd go to the order table and make a call for each Order ID to get the Contact Id's. That's 10 more API calls. Then I'd go to the Contacts table and make a call for each Contact ID to get the name and address. That's another 10 API calls, for a total of 21 calls giving me just the minimal data I need. In Infusionsoft world, we need to think differently. *Instead*, I'd make the same initial call to the order items table. Then I'd make a single call to the order table to pull all of the orders that came in on that date, which may be 500+ orders. So only one additional call to the API instead of 10, but I'm receiving much more data than I need. Then I compare that data on my end to the data I already pulled to get my 10 order IDs. I do a single call to the Contact table for all the contacts that were created yesterday, which may be 800+, and maybe 6 of my 10 contact ID's will have been created on that date (because it was their first order), but then I still have to make 4 additional calls for the repeat customers that weren't created on the same date as their order date. So I've brought my API calls down from 21 calls to 6 calls, but I'm now working with 800+ contact records, 500+ order records, and 10 order item records, instead of 10 of each. Some developers have resorted to backing up all the tables they can daily, to a cached database to stay under the API limits, which cannot be increased, even if you're willing to pay more. And then, even with conservative API calling, some business needs will outgrow the limits. Infusionsoft is well suited for any company that will actually use its features. It does a lot, and has a steep learning curve, but its abundance of features are only good if you're going to use them. Its price is very manageable for any company doing at least a few thousand dollars a month in business. It can be tough to swallow, though for smaller startups where the few hundred dollar cost could wipe out all the profit. Infusionsoft by Keap Review: "Consider Infusionsoft as Your Ideal Marketing Automation Platform of Choice"
After trying and using several different marketing automation systems, we decided to stick with Infusionsoft. We chose Infusionsoft because it was one of the few marketing automation platforms that met the greatest number of our business needs while being reasonable in pricing. It is currently being used by our sales and marketing department, and in the future will be utilized by client services to facilitate order processing/fulfillment. Making it very easy to prioritize contacts for sales teams based on the contact's activity and responsiveness. Provides email marketing, landing page creation and a CRM. There is a learning curve that someone new to Infusionsoft must go through, but they do provide good resources and training materials. It would be nice to have better integration with social media channels and tracking. The complexity of Infusionsoft can be a turn off to team members who are not very technical, but there are ways around that with good implementation and training. For a small to medium sized business, Infusionsoft is worth looking at because the automation capabilities of Infusionsoft can allow the business to get more done with fewer staff members. The software can do a lot, so smaller businesses may not use every feature that the software is capable of doing, but it gives room to grow and expand. Infusionsoft by Keap Review: "Great Marketing Tool"
Infusionsoft is being used for marketing, landing pages, drip marketing, lead forms, and integration with Salesforce. The problems it is solving are entering demographics into Salesforce based on lead forms, capturing data for marketing on landing pages, getting more sales based on looky loos as they will be added to the drip marketing system and get them down the line when they are ready. When a new lead goes to your website and isn't ready to be contacted by your sales team, they are then added to a drip marketing system so they can be captured at a later date. We also have a lot of marketing events where we capture leads on paper and it gives us an easy way to enter them quickly into our CRM system. Creating those forms for your landing pages based on marketing you may be doing on social media and or SEO. Infusionsoft by Keap Review: "Features, Features, Features"
We are currently using Infusionsoft to build out marketing campaigns for our done-for-you video services as well as a do-it-yourself video product. My marketing officer, Danielle, builds out the campaigns and integrates it with Clickfunnels. We are also learning how to utilize the decision diamond and other tactics within the system to drive better engagement and to use Infusionsofe to its fullest potential. It's a fully functioning all-in-one CRM. You can integrate other landing page software with ease. Great for surveys and assessments. Infusionsoft can be difficult to learn and it's an additional cost to outsource. It can get expensive for startups >150K a year. Infusionsoft is well suited for digital marketers who are looking to uplevel their email automation system. It is also great for small businesses that are doing 200K+. It is not well suited for startups doing less than 150K a year in business. Infusionsoft by Keap Review: "A must have if you are trying to segment your list." We mainly use Infusionsoft to provide content for our leads to get them to convert to members in our style program. We also use it to provide our current members with information. We use it to promote events for our brick and mortar as well. Great at being able to segment your list. Use web forms and lead pages to capture leads. Detailed campaigns to put your customer through a journey. We have had issues linking it to different software in the past and being able to track revenue from other resources automatically. If you are wanting to grow your list and provide content to different lists this is helpful. Also, if you have evergreen content you want to automatically give your leads and customers. It is really great for service based businesses because you can track the leads and where they are at in the buying process. Infusionsoft by Keap Review: "Infusionsoft: Good system for a small- to mid-sized business"
Currently, our sales department is using Infusionsoft. It is very valuable to automate certain parts of campaigns that do not need manual effort. Comprehensive client history, automation, and sales funnel management have been a major plus. Good reporting of lead sources (eg. social media; web form; email etc). Integrations for things like websites and products like QuickBooks. Automation is a major leap forward for a smaller business. Teams will need to be trained in detail before the system can be used to its full potential. Initial setup and/or migration can potentially require a lot of lead time. Online Self-service support will cover basic topics and concepts but online support chat with longer wait times may be required for anything beyond that. Lead-generating campaigns involving channels such as email broadcasts are well-handled by the software and the ability to automate much of the process expedites things. As previously stated the reporting is very good for discovering what channels have the best lead-gen and/or ROI so the focus can remain on revenue generating methods. Out-of-the-box campaigns available in the marketplace are good, but it can be difficult to create customized campaigns for unconventional situations or niche markets. Infusionsoft by Keap Review: "Dierks Farms Excels With Infusionsoft"
Infusionsoft is used in all aspects of our online business. We are a grass fed beef farm. We sell our product through our online store. We use Infusionsoft as our CRM, ecommerce, online marketing system for our fullfillment lists. We also own an advertising agency where I am a certified partner for Infusionsoft an sell the product to businesses that can benefit from this great technology. Infusionsoft solved a huge problem that we had with followup. Our online sales have increased tremendously since we implemented Infusionsoft and our followup which was non existent before we implemented Infusionsoft and attended Accelerator. It was definately the best thing we have done! Dierks Farms was the 2017 Small Business ICON winner. This is how much we have grown since we implemented this system. Followup, followup, followup. The email follow-up campaigns are invaluable. Data base building. The connection to the lead generation sources and the campaigns that followup are great. E-commerce system is very dependable and very easy to use. Accelerator - This is what really helped our our business take off. This 3 week clinic is AWESOME!! Infusionsoft payments. The support on this could be better. Templates for emails could use some updating. Cart options could be expanded to be able to add more options such as properties for realtors. Infusionsoft is very suited for any type of business that is looking to reach customers both business to customer and business to business. It is set up for both and is very effective for both. I believe the only business that Infusionsoft isn't for is a business that is not wanting to promote itself which I haven't met one of these yet. Infusionsoft by Keap Review: "If you hate your business... then don't get Infusionsoft"
After using Infusionsoft for a business I work with, I decided it was the next logical step in my own business. The ability to efficiently and effectively automate and streamline my affiliate program, e-commerce, marketing campaigns, digital product delivery, and task system has made things much easier and effective. It allows me to make sure only the people who emails are relevant to are receiving them instead of my entire list. It's increased list retention, engagement, growth, and satisfaction. It is well suited for anyone who runs a small business really. It integrates with almost everything. It wouldn't be well suited for someone who is a hobbyist or not serious about their business. Infusionsoft by Keap Review: "Infusionsoft helps me"
We use it for lead capture and nurture, closing business, and managing upsells. The automation side of things has made life much simpler, and now I know who all my leads are. All of their information is in one easy to search place, and I can segment them effectively. It makes knowing who needs what from me easy and it helps ensure no one falls between the cracks. The software is easy to use and is very effective. The help desk/support is excellent, even if they do not know the answer they will find it. The value for what you get is excellent it truly is the Cadillac of CRMs. They could still do a better job of differentiating themselves from the competition. I would like to see less turnover in the people overseeing partners, etc. I want to see a clear focus on one or two things to make them great, often seems they are pursuing too many things. I work with a lot of solo-preneurs so the monthly cost can be prohibitive to them to get started. Once they start using the platform and see all of the benefits of the platform it becomes cost-effective, but helping them to see that at the beginning is a challenge. It does make a world fo difference for everyone I work with from an organizational and strategy perspective. Infusionsoft by Keap Review: "Great sales management, marketing automation tool for small business"
We use Infusionsoft for our own business and for our clients. We use it to manage our sales pipeline, automate our marketing and client management. Great for a business that sells info products or high ticket services. Maybe not so good for high volume product based eCommerce. Infusionsoft by Keap (formerly Infusionsoft) is a CRM and marketing automation platform that promises to automates sales, marketing, and business processes in one place to give sales teams increased flexibility. The vendor says Infusionsoft by Keap allows salespeople to easily deliver the right message to the right customer automatically through custom automations and workflows. Infusionsoft by Keap also offers sales & marketing performance insights with its reports. Infusionsoft Marketing Automation - Automate Email Marketing tasks and use advanced segmentation and personalization to deliver customized email communications to your customers and prospects.Infusionsoft ecommerce - With an online storefront and shopping cart, Infusionsoft enables you to go from initial interest to closed sale online. Advanced referral management enables for integrated affiliate programs as well.